Chairman of Azerbaijan’s State Customs Committee, Lieutenant-General of the Customs Service Safar Mehdiyev met with Ambassador of Mexico to Azerbaijan Juan Rodrigo Labardini Flores, Azerbaijan’s State Customs Committee said in a message. During the meeting, it was noted that Baku will host a conference and exhibition of the World Customs Organization. Mehdiyev spoke about the relations between Azerbaijan and Mexico in both political and economic spheres. He noted that the wide economic potential of both countries makes it possible to further develop relations in this direction, and expressed hope for more successful results. 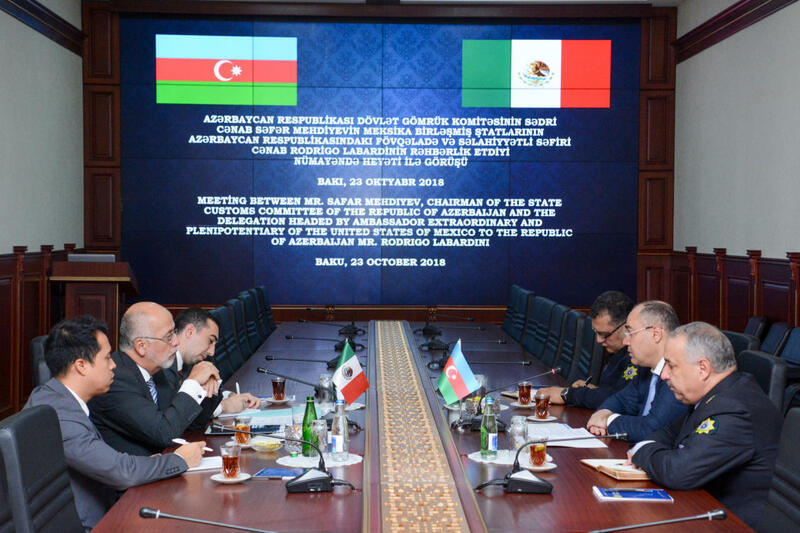 It was also emphasized that as part of various international events, conferences and seminars, meetings of the heads and employees of the customs authorities of both countries are held periodically, and after an agreement is signed between the governments of Azerbaijan and Mexico on mutual administrative assistance in customs matters and information exchange, these ties will develop more effectively. Mehdiyev also touched upon effective working relations with international organizations and customs structures and regarded holding of the conference on information technologies and the exhibition of the World Customs Organization in Azerbaijan in June 2019 as contribution of the Azerbaijani customs service to global customs services. The Mexican ambassador spoke about the relations between the two countries and noted that they are rapidly developing. It was noted that the signing in the near future of an agreement between the government of Azerbaijan and the government of Mexico on mutual administrative assistance in customs matters and information exchange will create conditions for the further strengthening of ties between the two countries and the growth of trade turnover.